The range of fully stainless steel packing machines known as ‘SmartFil’ are now available from Nu-Con. The range includes four model sizes of 25kg packing machines, as well as, Bulk Bag Filling, Bin Filling Systems and Sealers. This means Nu-Cons Client’s are not only supplied turnkey installations including pneumatic conveying, screening, blending, weigh batching and bulk storage, but also now have the one same supplier for their packing needs as well. The 25kg Packing Machines have been designed with stringent hygiene requirements and quick demountability features required during product changes in the demanding worldwide dairy industry of milk powder. The range of products has been designed from the base up to give quick demountability, excellent dust suppression and high accuracy in the bag. 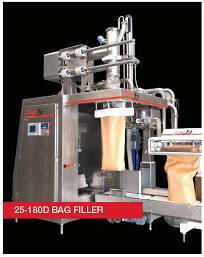 This photo shows the “SmartFil” 25-180D Bag Filler. 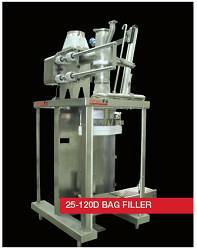 It is a highly accurate, 3 x 25kg bags per minute (4,500kg per hour) filler designed specifically for dairy and other high grade powder packaging applications. Reduces wasteful overfilling and eliminates manual top-off – excellent R.O.I. The second photo shows the basic ‘SmartFil’ 25-120DP filler, design for low packing rates of up to 3,000kg/hr, an excellent machine for low rate or bagging of rework. Like all the other Models in the range, the 25-120DP is also quick demountable for easy cleaning. These packing machines are manufactured and tested at Nu-Con’s own production facility in Auckland, New Zealand, and marketed throughout the group by way of their offices in New Zealand, Australia, USA, Singapore, Malaysia, Europe, China and Indonesia.